With the break in the cold temperatures and spring making its appearance, patio season is now in full effect. The ability to enjoy beers and cocktails on a deck is, once again, ours for the taking. 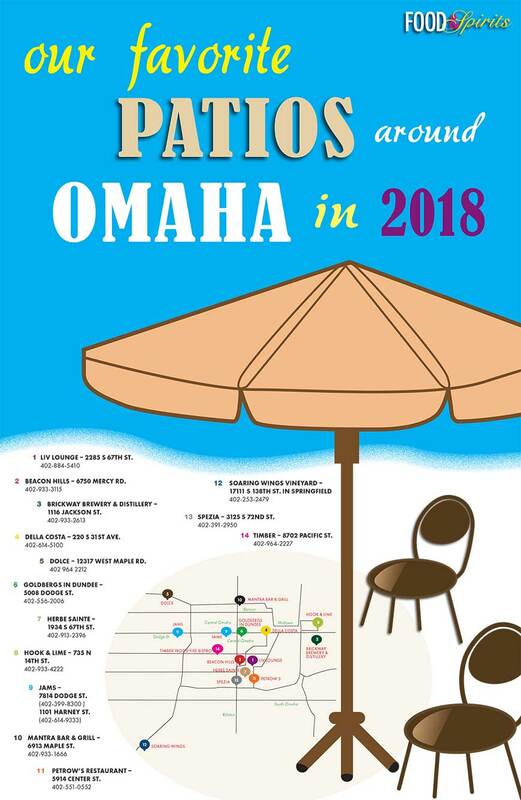 With that in mind, Food & Spirits Magazine has compiled a list of some of our favorite patios to be found in the Omaha Metro. Make sure to check out the accompanying map to find the best patio near you! An award-winning cocktail bar in the Aksarben Village area of Omaha, LIV Lounge offers an extensive cocktail menu, diverse wine & beer selections, and small plate appetizers in a warm and inviting environment, including a large outdoor patio. Since opening in 2009, LIV Lounge has become one of the most respected cocktail bars in Omaha with a menu that includes over 100 hand-crafted classic and craft cocktails. Only steps away from Stinson Park, Baxter Arena, the Keystone Trail, restaurants, theaters, hotels, shopping and convenient free parking, LIV Lounge is the perfect place for happy hour, after-dinner drinks, or evening cocktails in a civilized setting. The LIV Lounge outdoor patio, one of the largest outdoor patio spaces of any cocktail bar in the area, is a popular spot for groups large and small. With a gas-fired fire pit, bistro table seating, and designated outdoor wait staff, the LIV patio provides a relaxing setting for socializing with friends, enjoying fresh air, day-time sun shine and evening star gazing. A patio like no other. The patio at Beacon Hills in Aksarben Village is your outdoor destination. It’s your gathering place for weekend brunch, a casual lunch or the best happy hour in town complete with a fireplace for the nights that get a bit too chilly and shade on the hot days. If the experience doesn’t hook you the food will. Is weekend brunch on your check list? Brunch is offered every Saturday and Sunday, 9-2 pm. Stop by before or after your Sunday walk through the Omaha Farmers Market, but come early as the patio is on a first come, first serve basis. Is happy hour on your check list? Beacon Hills Patio Party offers amazing cocktail, beer, wine, and food specials Monday-Friday 2-6 p.m. Our Patio Happy Hour always out ranks rush hour. Enjoy a cold beer or have Beacon Hills famous crab cakes while enjoying the warm vibes of the summer. Brickway, located in the Old Market, has one of the best patios in the area with the south facing deck insuring sun all throughout the day. Daily happy hour drink specials are available throughout the week and feature $4 Session Series beers. Weekend day-drinking specials include $5 Bloody Marys & Beermosas from open to close. Brickway offers a massive selection of local brews and spirits with over 15 Brickway beers as well as at least 6 of their own spirits, including their American Single Malt Whisky. Brickway is open 2 pm to midnight Monday – Thursday, 11 am to 2 am Friday – Saturday, and 11 am to midnight on Sunday. Free tours Thursday to Sunday. Check www.drinkbrickway.com for tour times. The patio at Della Costa may just be one of the best patios in town. With an expansive view of not only Turner Park but also downtown Omaha, the patio at Della Costa does not want for a vista. Choose between their three couch sectionals boasting built in fire pits and comfortable patio tables made of granite. They can accommodate groups ranging from 2 up to large groups of 50 or more! Enjoy their unique Mediterranean cuisine in an unbelievable setting overlooking Midtown Crossing. Every night is date night at Dolce, and our intimate patio is the perfect place for it. If course style dining is your date night preference then Dolce is worth checking out. Dolce has a date night menu that can also be ordered a la carte. Dolce has a risotto of the day and a taste of the moment, a different dish created daily, allowing their chefs to achieve the highest level of culinary versatility. The second course brings a daily made soup and a couple of salads. The third courses bring steak, short rib, chicken and pork into play. If you’ve paced your appetite properly you’ll conclude with a dessert course. Dolce’s flexibility allows diners to frequently return to the restaurant and continue to expand their palate. Dolce creates food that creates a memory. Located in West Omaha their exquisite food, notable wine list, and refined ambiance will make you want to come back again and again. Goldbergs in Dundee offers a cozy, laid back atmosphere both indoors and out. With a full-service patio friendly to dog owners and able to accommodate groups up to 7 people, the only thing keeping people inside the restaurant is a chilly day. The wait staff stay customer focused throughout your meal, meaning prompt and friendly service; allowing you to enjoy the experience of going out to eat. From famous Bloody Marys, a full bar, and food choices aplenty, there is something for everyone at Goldbergs. To emphasize the food choices offered, since December 2016 Goldbergs carries a Range-Free burger that is gluten-free, vegan, and contains no GMOs. Many independent restaurants come and go but with the continued support of the neighborhood and watchful eyes of the staff, Goldbergs in Dundee will continue to welcome its customers with great food and a warm and friendly atmosphere for many years to come. The patio at Herbe Sainte is small and intimate like the inside space. Offering 2 couch selections with fire pits and multiple tables, they can accommodate any size group. With an amazing view of the HDR development and the heart of Aksarben Village, the patio at Herbe Sainte is prime real estate for people watching, cocktail sipping and relaxing. Enjoy Cajun/Creole fair in style on the patio of Herbe Sainte. Stop by Hook & Lime in North Downtown for delicious tacos on house-made tortillas, a world-class selection of tequilas and mezcals, and a mouthwatering list of margaritas. The chefs at Hook & Lime prepare every taco, shareable small plate and entree from scratch with the best locally sourced meats, fresh seafood, and produce available. The margaritas are always made with freshly squeezed citrus juices, and house-made syrups and infusions. Dining at Hook & Lime is an experience you won’t soon forget. Grab a seat on our spacious downtown patio and relax in the sun with one of the city’s best margaritas in your hand and amazing food on your plate. Reservations accepted but walk-ins are always welcome. Check out the menu at hookandlime.com or stop by on 14th street, just south of Cuming. Free parking lot on the east side of the building; entrance on 14th St. Jams, an Omaha restaurant legacy, is an American grill that offers a melting pot of different styles and varieties of food dishes containing high-quality ingredients paired with the optional cold drink or creative cocktail. Opened on 78th and Dodge, twenty-five years ago, it has become a favorite local eatery. In 2015, a second location was opened on the corner of 11th and Harney in the Old Market of Omaha offering the same fine menu but with the addition of a lovely outdoor patio on the east side. Jams offers an excellent happy hour, Monday thru Friday from 3 pm until 6 pm at both locations with drink and appetizers specials. Jams also offers a Saturday brunch from 11 am until 2 pm at the Old Market location and Sunday brunch at both locations from 10 am to 1 pm. Seasonal food menus offer the best their chefs have to offer and pairings with their wine offerings abound. You can’t go wrong with either location. Reservations available through Yelp Reservations. Delivery available thru Skip The Dishes. They can be found on Facebook, Instagram and Twitter, or at jamseats.com. Summer has arrived and Mantra Bar and Grille’s patio is ready for you and your dog to enjoy. Whether it’s a brisk evening cozying up next to the gas fire pit with our famous cabbage and blue cheese soup or a warm Saturday/Sunday brunch cooling off with one our many flavors of bottomless mimosas, Mantra has you covered. The Mantra patio also makes for a great spot to stop by after a movie, concert or play. The edgy yet elegant environment is attractive to all clientele. Happy hour is Monday – Friday from 4:30 to 6 pm and features $4 margaritas and house wines, $6 signature craft cocktails, as well as $6 shareable plates. Looking for a fun brunch get together? Mantra’s highly popular brunch offers a spread of delicious brunch food items with their own Mantra twist. They are open Mondays at 4:30, Tuesdays thru Friday at 11 am until 2 pm, then open back up at 4:30 for happy hour. Saturdays they open at 10 am until late night drinks and then do it all over again Sunday at 9 am. Sunday and Monday nights are half price bottles of wine. See you on the patio! Petrow’s recently added one of the best outdoor spaces in Midtown Omaha. With seating for 65 and a bar capacity of over 200, their patio lends itself to accommodating any event or casual dining experience with a contemporary feel. Stay comfortable eight months out of the year with an automatic louvered and watertight awning keeping the area cool and shaded in hot weather and dry if rainy. Heaters warm the space on cool days and nights. Big screen TVs along with water and fire features complement their patio and bar menu. The fast casual menu features salads, wraps, homemade falafels and appetizers. Enjoy a beer or a drink with drink specials and a full bar. Petrow’s on the Patio is open for breakfast (self-service), lunch and dinner Monday through Saturday during the outdoor dining season. Some of the world’s finest wines are just a short distance away. The feel of Napa and Sonoma, just a short drive. Amazing sunsets and fantastic beers, are within your reach. Amazing staff who can tell you about wine and beer, are just before you. Fantastic regional and local talent perform in our new amphitheater so close, you could reach out and touch them. The fruitfulness and nature of the vineyard, are within your step. Hundreds of medals these wines have won, and are now for you to have. Outdoor concerts, party room rentals, dinners, meetings, engagements, weddings, music year round, outdoor seating for all on our patio and covered deck are just a taste of the things you will find. Just a few miles south of Omaha, Soaring Wings Vineyard and Brewing is located in Springfield. Enjoy the Good Life! Come, get close to us and enjoy life! Spezia has a quaint hidden patio off the main dining room and bar. The architectural charm of the building is well received with brick surround and slanted windows. Two large trees shade the area and rows of string lights add a nice ambiance as the sun goes down. First come, first serve and weather permitting. Serving lunch and dinner seven days a week and a brunch buffet on Sunday morning. Expertly prepared wood fire steaks, seafood and innovative pasta dishes offer excellent variety from their award winning menu. High backed booths provide privacy under sky lit windows or in the cozy “cave” area. Along with craft cocktails and an extensive wine list, Spezia has happy hour every day from 4-6 pm with ½ price cocktails Private party rooms available for large groups, weddings, meetings or special events. Reservations recommended. Come experience the delicious wood-fired cuisine at Timber Wood Fire Bistro. With a roaring hearth and warm atmosphere you’ll feel at home the moment you walk in. Enjoy their wood oven-baked sour dough bread service with herbed California olive oil or locally whipped butter. Try one of their pissaladière — French style pizzas — wood fired to perfection. Select from one of the fresh-from-the-fire entrees including their house-made rigatoni with roasted vegetables, herb crusted bistro steak and cedar planked steelhead salmon. All of their meals are made-from-scratch and served with care by an experienced staff. Happy hour on the patio daily from 2-7 pm.